Today we'll review the DPBSD MP3 of the Imperial Grand 3D from Sound Magic - thanks yet again to Johnny-on-the-spot pesk for providing prompt and professional grade rendering! Well, where to begin. This is some kind of sampler / synthesis hybrid, with fairly long samples used in the attack and initial decay, which then switches to a synthesized final decay of some sort. Since the advent of Roland's SuperNATURAL technology I've been pretty much sold on the hybrid approach. And I don't want to be seen as dumping unnecessarily on this new take on hybrids, lord knows we can use all the players in this field we can get, but this entry really needs some work. Except for pedal down sympathetic resonance, it basically fails every DPBSD test, and other strange quirks were exposed during the testing as well. In the first two phases of the pedal down sympathetic resonance test I heard some pure tones pop in about 12 seconds into the decay. And at the end of the C1 looping test the note plays again, I believe at the key up point, which is strange. There was no evidence of key down sympathetic resonance, and it failed the pedal down silent replay test, the brief pedal partial damping test, and the the partial pedaling test. During the partial pedaling test I noticed the notes played with pedal positions 111 and 95 were noticeably brighter & louder than notes played with pedal positions of 127, 63, 31, and 0, which is odd. The attack sample lengths are quite long, which is nice, but the periods of the synthesized decay sections are short, and as a result are static and fake sounding. This instrument is visibly and audibly stretched, with all stretch groups of 3 except for the top two notes and the bottom two notes which are groups of 2. The variation in timbre (muffled/bright) between adjacent stretch groups is very pronounced, and I also noticed the stereo pan between adjacent stretch groups isn't monotonic, that is, the left/right location in the stereo field doesn't go evenly from left to right as you go up the keyboard, but bobbles around a fair amount. There is an abrupt velocity switch @ vel=66 that is very visible & audible. I couldn't hear any timbre change (and almost no volume change) below velocity 66, though there was smooth timbre variation with velocity above that. The dynamic range is the smallest I've seen, and as a result notes played at velocity 1 were way too loud. All in all I'd recommend a pass on this unless / until they fix the major issues with it. IMO even the free demo download most likely isn't worth your time. 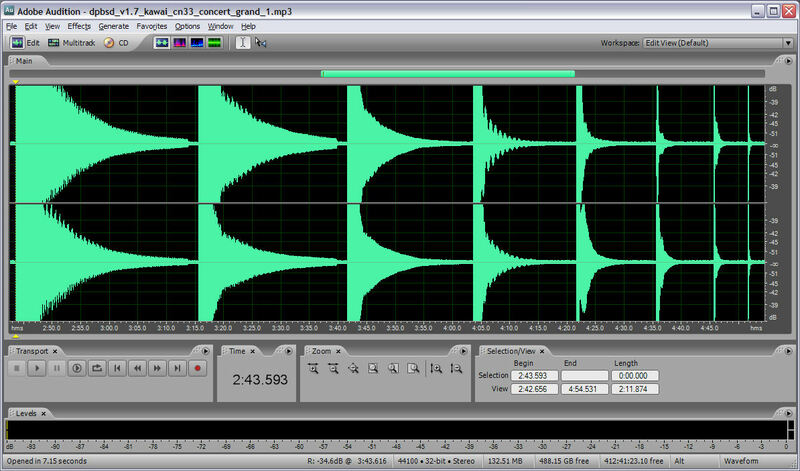 Waveform view of the entire loop test with some vertical zoom - note the unnaturally linear decay tails, and the replay of C1 at key-up. 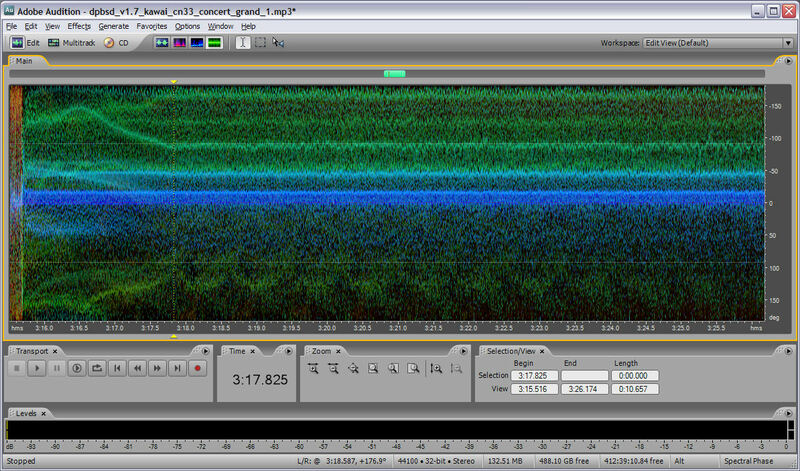 Spectral pan view of the note C3 (highly compressed) - note the huge difference between the sample attack & decay, and the static model decay process. It sounds about as bad as it looks. 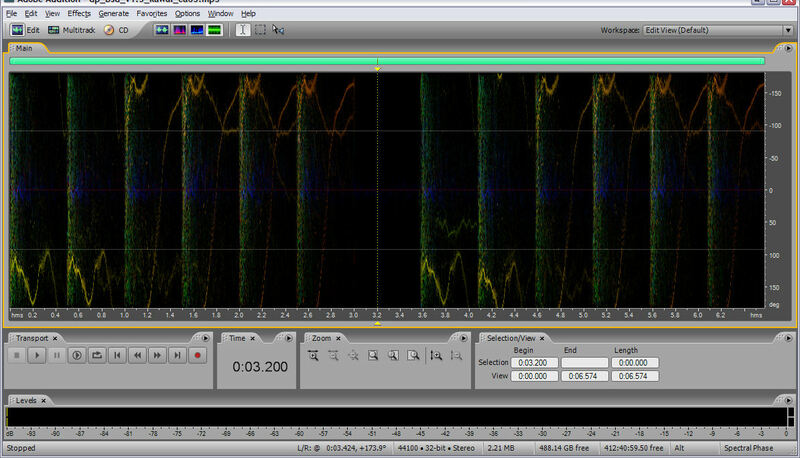 Spectral pan view of the note C7 (highly compressed) - one of the weirdest note decays I've ever seen. Spectral phase view of the stretch test (low notes) - stretch groups of 3 all the way. 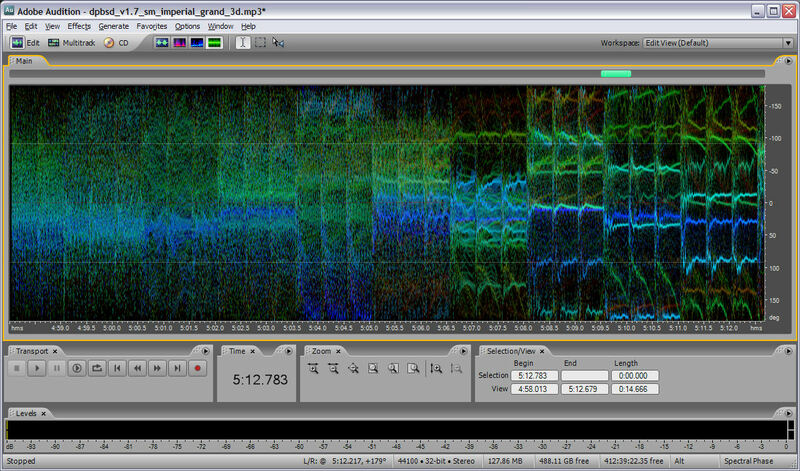 Waveform view of the entire layer test - dynamic range is only 14dB between velocity 1 and 127! 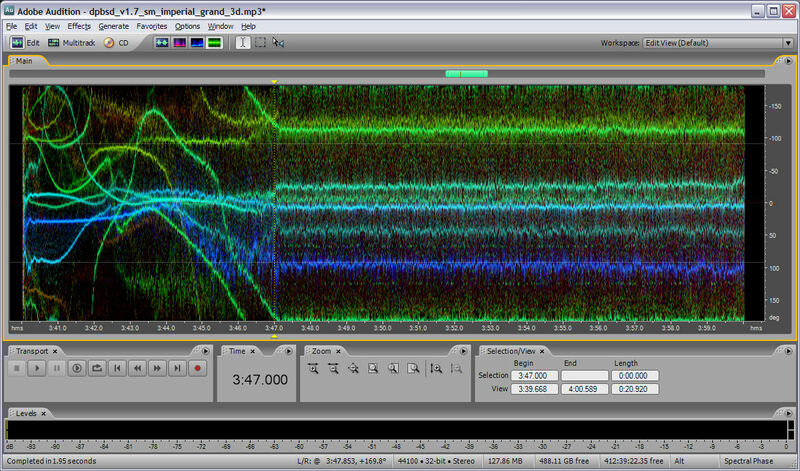 Spectral phase view of the layer test - note very the abrupt layer switch. 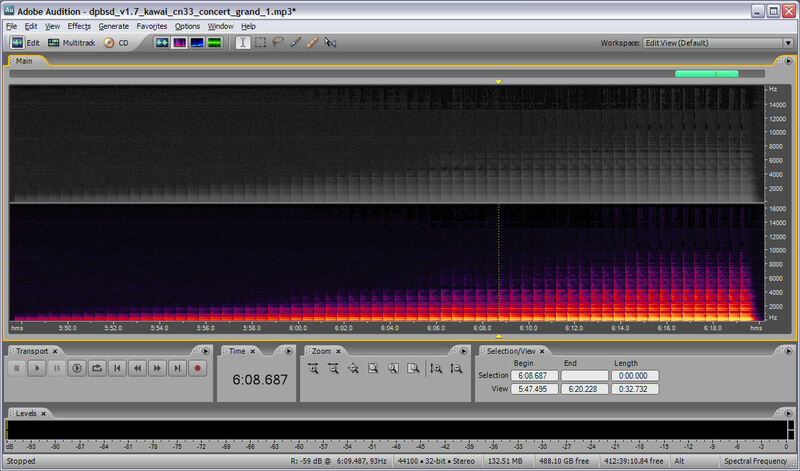 Spectral frequency view of the layer test - no timbre change until you hit the layer switch. - Free downloadable demo, first preset, default settings. - Passes the pedal down sympathetic resonance test, the effect is quite audible. - Pedal down sound is a "thump". - Strange constant tones in some decay tails (e.g. ~12 seconds into pedal down sympathetic resonance test). - Fails the key down sympathetic resonance test. - Velocity=1 notes are quite loud! - Fails the pedal down silent replay test @ C2 velocity=1 - the note plays quite loudly. - Notes played with pedal=111,95 are noticeably brighter & louder than pedal=127,63,31,0! - Visibly and audibly looped (or whatever). - Attack sample lengths are (C1:C8): 9.4,9.7,7.1,5.6,4.0,2.5,1.2,? seconds. - Loop lengths are (C1:C8): 0.5,0.2,?,?,?,?,?,? seconds. - Loops (or whatever they are) are very static sounding. - Decay time for higher notes is rather short. - C1 plays again at the end of the looping test (@ key up?)! - Visibly and audibly quite stretched. - Stretch distances: 2,3(x28),2 = 30 groups. 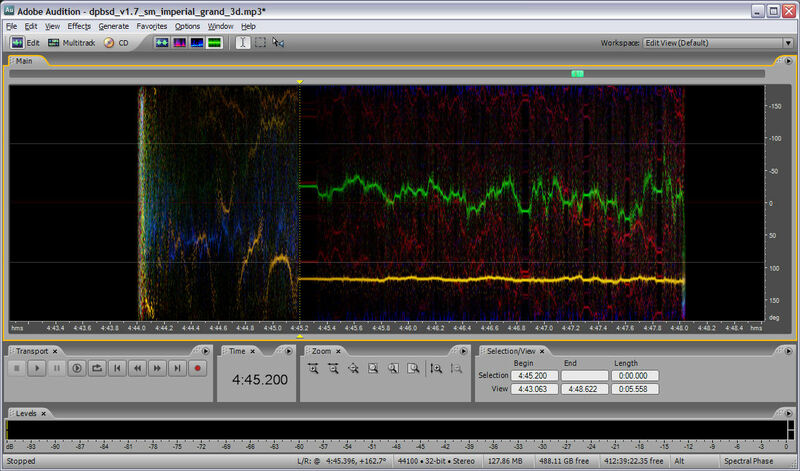 - Variation in timbre (muffled/bright) between adjacent stretch groups is very pronounced. - Stereo pan between adjacent stretch groups is non-monotonic. - Velocity switch @ vel=66 is very visible & audible. 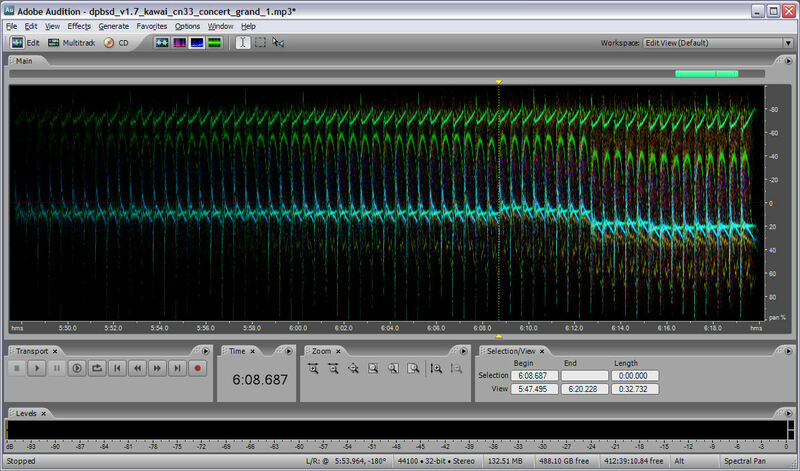 - No timbre change (and almost no volume change) below vel=66, smooth timbre variation above that. - Dynamic range unnaturally small 14.5dB (vel=1:127). - MP3 levels: peak @ -2.36dB, noise floor @ -90dB. I wonder does it make sense to investigate the way samples are panned in every DP from here? Not sure I follow. Do you mean panned in the negative review sense or in the stereo left / right sense? I mean does low and high notes sound wide spread or not. When you press the lowest key, is it significantly louder in your left ear? Last edited by kiedysktos. ; 06/06/10 05:36 PM. Yes, that's the case in all DPs and PC samplers I've reviewed. 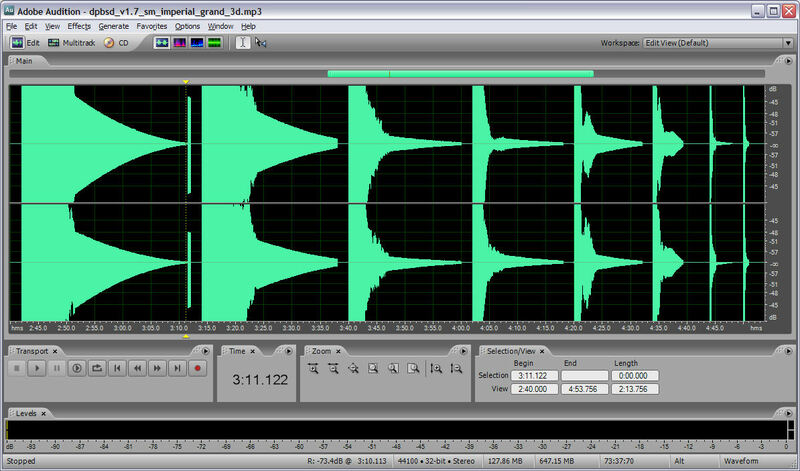 I listen for a smooth transition in stereo pan L=>R as the notes are played up the keyboard in the stretch test. The Sound Magic Imperial Grand 3D does this too but not smoothly at all. It must be kind of weird to play it and have adjacent notes popping out of random locations in the stereo field. Control is required for recording because the normal bass on left is almost always wrong for recorded music. Recording tries to capture what audience would hear and they almost never sit on the piano bench with the player. In a live classical piano performance the grand piano is almost always set up with keyboard on-end to audience. In this perspective the audience hears the bass to the rear. But mostly bass from the floor and highs reflect off the lid. You hear this if you are very close but past some distance it's all just room echo. If you were recording this you'd want the entire piano to be in the center and certainly not bass on left. We now have a DPBSD MP3 of the Kawai CN33 - much thanks to Mawima for providing it! Mawima actually ran the DPBSD MIDI file over the three main pianos in there, the Concert Grand 1, Studio Grand 1, and Mellow Grand 1 patches. I'm restricting my analysis here to the Concert Grand 1, but the other MP3s are at the share point for those who are interested in listening to / analyzing them. It is clear that the CN33 Concert Grand 1 patch shares the same sample set as the main piano voice on the CA63. By that I don't mean these two instruments share the same sample memory size - the attack phase signature is the same for both, but the lowest two octaves on the CN33 have significantly shorter attack and loop sample lengths than the CA63. As a result it is more obviously looped than the CA63, and the lower and mid notes could benefit from longer decay loops. There is almost no stretching to speak of, other than the group of 2 and group of 4 that the CA63 has as well, and the stretching of these notes isn't audible. Four discreet velocity layers are visible in the phase views, but to my ear they are smoothly blended as I don't hear any velocity switching (at least for the single note tested by the DPBSD, C4 or middle C). It passes the pedal down sympathetic resonance test, though audibly I find the effect has a somewhat bassy component - it isn't objectionable though. It also passes the key down sympathetic resonance test, and the effect is fairly realistic. Neither of these effects are present during MIDI playback, however. To hear them listen to the files kawai_cn33_cg1_damper_res_0-5-10.mp3 and kawai_cn33_cg1_string_res_0-5-10.mp3 respectively, which were also kindly provided by Mawima. The resonance was set to 0, then 5, and finally 10 for each of these manually played files. It passes the brief pedal partial damping and the partial pedaling tests, but fails the pedal down silent replay test - I think I hear the note playing at velocity =1 at pedal up which is wrong. And there are no pedal up/down or key up sound effects. 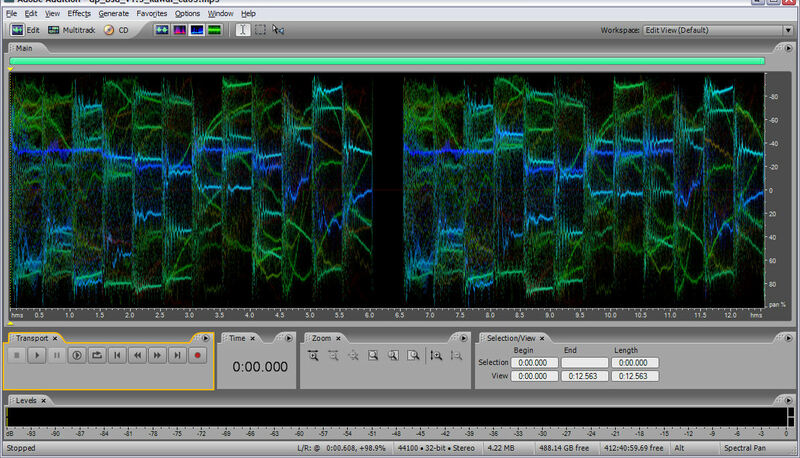 Spectral pan view of a lower octave of the stretch test. CA63 is on the left, CN33 on the right. It is very clear here that both share the same attack sample set, at least at this velocity. 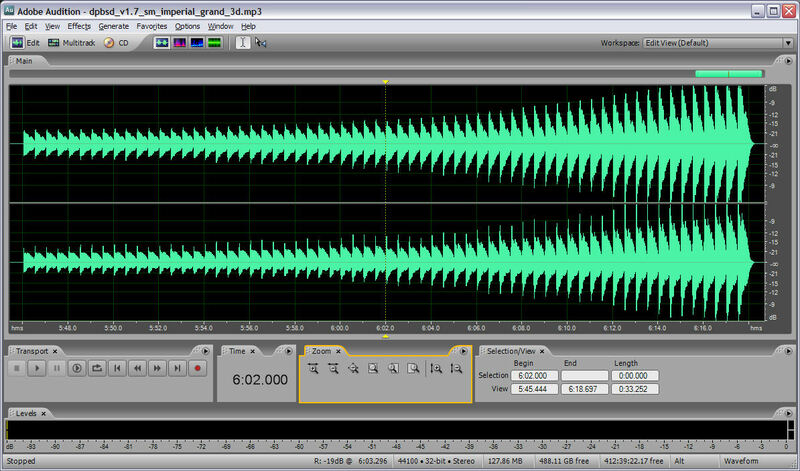 Waveform view of the looping test with vertical zoom applied. Low note decay times are nice and long, but higher notes decay rather quickly. You can see evidence of the four lowest notes looping here too. Spectral phase view of the looping test, compressed, for note C2. 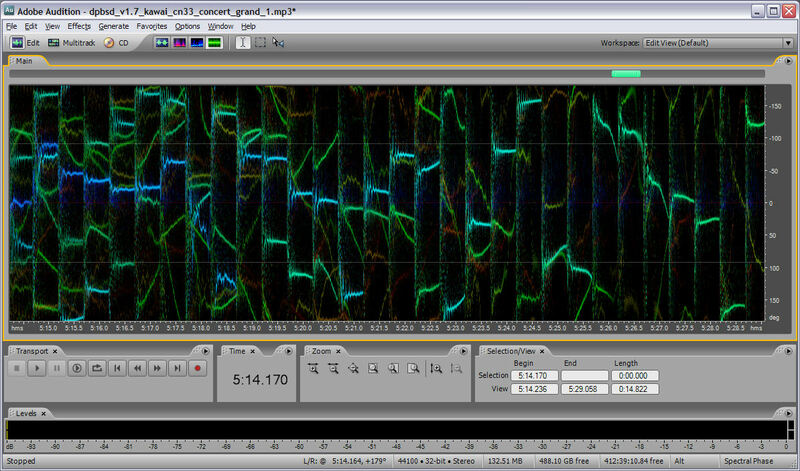 The attack sample and repeated loop sample are quite clearly seen here. Spectral phase view of the stretch test, mid notes. 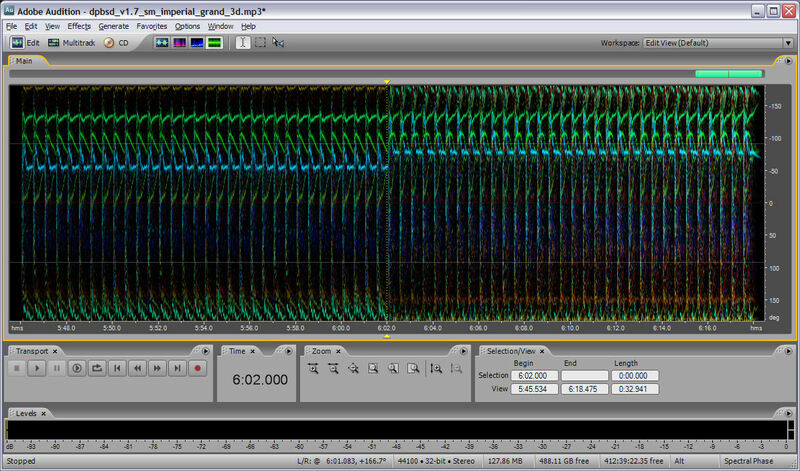 Very little stretching and none visible in this view - 84 samples cover 88 notes. Spectral pan view of the layer test. Four layers visible, no audible switching. 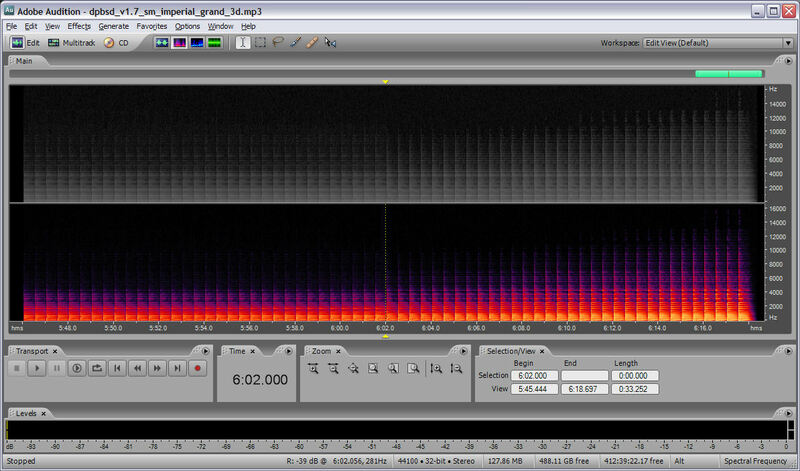 Spectral frequency view of layer test. Timber variation is audibly quite smooth. - Passes the pedal down sympathetic resonance test, the effect is somewhat bass heavy. - Passes the key down sympathetic resonance test, the effect is fairly realistic. - Passes the partial pedaling test. - This is a smoothly blended multi-velocity sample set. - Velocity switch @ vel=86,102,112 is visible but not audible. - Fails the pedal down silent replay test @ pedal up (note plays vel=1). - Decay times are somewhat short in the higher registers (~1 to 1/2 Pianoteq, low to high). - Attack sample lengths are (C1:C8): 1.8,2.1,2.1,1.8,1.7,1.6,1.1,? seconds. - Loop sample lengths are (C1:C8): 0.8,0.8,0.7,0.8,0.7,0.7,0.6,? seconds. - No key down or pedal down sympathetic resonance via MIDI playback. - Dynamic range 45dB (vel=1:127). - MP3 levels: peak @ -0.57dB, noise floor @ -68dB. Dewster, I'm another very appreciative person of your efforts and the work with the DPBSD project. I've been considering the CN33 and had decided to buy until I saw you post that you had the files from Mawima, and I have held off. Now here's the thing, I find your reviews interesting, useful and revealing, but now I find it hard to know what to make of the CN33 review. The review itself is fine, thanks, but I don't know how to assess its worth with respect to my purchase decision. I know you like the Roland SN sound, but I don't like the HP30x series, don't want or can't afford a RD700GXF, and anyway they're mostly priced well above the CN33. So maybe I just continue with my own findings - the CN33 is a delight to play, sounds great (to me) and for the price it's a great DP. Have I missed anything really BAD that your review reveals that I'm likely to be disappointed with further down the line? Now here's the thing, I find your reviews interesting, useful and revealing, but now I find it hard to know what to make of the CN33 review. The review itself is fine, thanks, but I don't know how to assess its worth with respect to my purchase decision. I have to say that I too find all of this interesting. It's always nice to have some kind of scientific backing to confirm what our ears tell us. I think it is important to state this - the bottom line for any purchase is how well you like the piano you've chosen or are thinking of buying. I learned today that my AvantGrand has samples that are ... drum roll ... looped. The thing is, I can't hear those loops. Should I have held out until Yamaha introduces a digital sample that contains no loops? I'll still rely on my ears and the connection that exists between the tactile response of the action and the sound I expect to hear. Thanks for another cool test result. I have a question. I am not technically proficient and am sure I'm missing something. But the test results note that there are 84 samples. From reading the literature I expected the number would be 88. Am not understanding the literature or the result correctly? Dewster, are you absolutely certain that there is this tiny amount of stretching? I know you like the Roland SN sound, but I don't like the HP30x series, don't want or can't afford a RD700GXF, and anyway they're mostly priced well above the CN33. Technically, the Roland SN sound is quite an achievement. Whether I like the sound in an aesthetic sense, and over the long-term, is quite another thing altogether. I just haven't been exposed to SN enough to know if there are sonic gremlins lurking in there or not. The actual sample is tiny, but the decay process seems to be based on V-Piano technology, with the implied expressiveness that goes along with that. I'm starting to appreciate and prefer the sound of darker pianos in general, which is a step in the SN direction I suppose. DPs are package deals, and the minimum I'd want is SN piano with PHAIII keys in a stage piano slab, which they don't make yet. Decent pipe organs would really push me over the edge. If they could move the joystick and make the whole thing lighter (easily ported by one person) that would help a lot too. And having all the sounds and features playable via MIDI is pretty much mandatory, I don't want them missing or to have to jump through a bunch of SYSEX hoops to enable them. But of course the Roland SN and Kawai both have issues in this department. So maybe I just continue with my own findings - the CN33 is a delight to play, sounds great (to me) and for the price it's a great DP. Have I missed anything really BAD that your review reveals that I'm likely to be disappointed with further down the line? Have you listened to the DPBSD looping test? Particularly the two lowest notes C1 & C2? You might compare them to the same two notes on the CA63 just to see what you might be missing. To me the looping of the CN33 low end is fairly obvious and the beating unnaturally fast, but my pain threshold for these things is very low, and my use of the instrument is likely completely different from yours. Here is a short MP3 of the two notes in this order: C1/CA63, C1/CN33, C2/CA63, C2/CN33. But this is all relative to how much you will spend on a competing product and how well it performs & sounds. How much will you have to pay for the CN33? Last edited by dewster; 06/23/10 07:20 PM. ...But the test results note that there are 84 samples. From reading the literature I expected the number would be 88. Am not understanding the literature or the result correctly? Spectral phase view of a the stretched notes. CA63 is on the left, CN33 on the right. I've seen a fair amount of stretching in my day. This stretching isn't audible (to me at least) because it's located rather high on the keyboard, so I can't absolutely confirm it. But I'd bet money that this is stretching based on the images alone. Phase is pretty random, and if you see identical phase prints in a row, particularly more than two in a row, odds are excellent you're looking at stretching. Here is a link to my reply to KAWAI James on the subject. Stretching isn't necessarily a bad thing if it is minor, restricted to the upper registers, and particularly if it is improving the overall sound by getting rid of bad sounding notes on the source instrument. We can't know if that last case is true or not, but at least here it isn't audible. If I owned one and I found out later that this was going on in the bass region I'd probably be a little steamed. But the way it's done here isn't really anything to get upset over. thanks for the patient reply. Sorry to be redundant, I either missed the CA-63 follow discussion, or didn't understand it well enough when I first encountered it for it to stick with me. Sorry to be redundant, I either missed the CA-63 follow discussion, or didn't understand it well enough when I first encountered it for it to stick with me. Not your fault at all, the SNR on the DPBSD thread was pretty bad around that time. And some things bear repeating IMO. The CN33 samples and the string/damper resonance effects are astonishingly good for a piano in this price range. Technically, they are better than a lot of the competition. You get the sound of the current Kawai DPs with slightly more looping than in the CA63/CA93. In normal playing, I guess, you won't recognize it. If you like the sound but want to have the best, then you need to buy a CA63 or CA93. We now know they have slightly better samples. They have a more expensive speaker system and are more adjustable (equalizer etc). But if your budget is limited, then the CN33 might be a great buy for you. That's quite an interesting observation, dewster. Given that your measurements are correct, the only other reasonable (or should I say challenging) explanation I could think of is the following: based on intellectual property and background info I'm quite convinced that Kawai is not just employing simple sample playback, but is at least partly using some kind of state of the art additive/frequency domain resynthesis method for building up their dynamic piano sound (this has not been confirmed by Kawai in any way though). As you know, in the frequency domain it would be possible to dynamically set the phase, independent of the amplitude of the partials. Maybe this has been done with identical phases for those mentioned four notes, because it is inaudible and possibly saves a bit of memory space. A small optimization by the developers in order to stay within hardware boundaries perhaps? This could explain why Kawai explicitely states full 88-key recording/sampling and no stretching at all. I.m.h.o. they are probably still right, albeit with an (inaudible) twist. Yes, I agree with that. The string resonance (key down sympathetic resonance) is really pretty well done from the small sample I've heard. To me anyway, sympathetic resonance is what piano is all about. Thanks guys, Dewster, Mawima, others. I think that at my current skill level, which might improve, and aural perception level which might not improve, I will go with a CN33 for now. The additional price of the CA63 to the CN33 is wasted on me. In my opinion, money spent on a really good teacher makes more sense than money spent on a lot of digital piano. Of course you will improve if you want to and upgrading pieces and upgrading pianos over the years is fun too. Enjoy your choice. Kawai makes awesome instruments.